The cheer haran sequence forms one of the most important chapters in the epic saga Mahabharat, and was quite a daunting task to shoot. Producer Siddharth Kumar Tiwary, who has also directed this particular sequence for the show reveals that it took about 20 days to shoot. “It’s a critical scene that required a lot of detailing and VFX. I took some time to decide how I wanted to show it to the viewers, and spent over a month just to write and plan the scene,” explains Tiwary. In fact, the team is still working on the VFX and according to the makers, it’s one of the best shot sequences in the show. Rajshree Thakur made a comeback with Bharat Ka Veer Putra Maharana Pratap, five years after her show Saat Phere ended on Zee. Now, one hears that the actress plans to quit Maharana Pratap because of the hectic schedule. 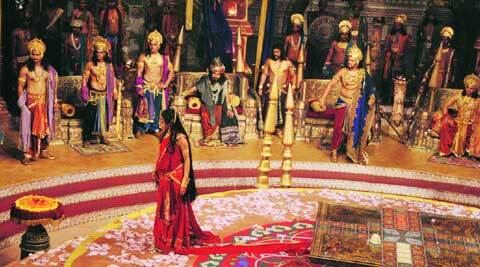 Since the show is a historical saga, the shooting is quite gruelling considering that at times it’s shot on actual locations. Presently, the show is being shot in Vapi, Gujarat, and according to a source, Thakur has several health issues due to the hot weather and long working hours. But she will continue shooting till a replacement is found. According to sources, the makers have approached actresses like Rupa Ganguly, Narayani Shashtri, Shruti Ulfat, and Iravati Harshe to step into her shoes.